Cabbage gets a bad rap. A lot of people think it's yucky, or only good in slaw. We love cabbage here at our house. Charlie likes his boiled, but I like it fried. So we compromised. 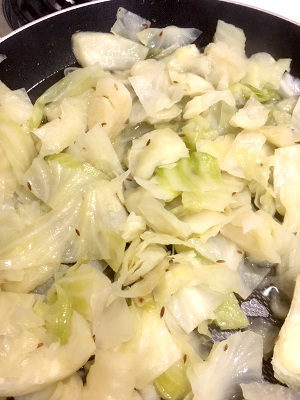 I put some oil and water in a pan with chopped cabbage, caraway seeds, salt, and onion powder (because Charlie can't do onions). Covered and cooked on low until the cabbage began to be tender. Took off the lid and turned up the heat a bit and cooked the water out. It was tender, but the thick cuts were still crisp, juicy, and flavorful. Definitely a keeper. I like cabbage in slaw, too. Apple slaw sounds intriguing -- I'm guessing that has shredded apple in it, as well as cabbage, carrots, and onion? Or no onion? I generally prefer savory slaw to sweet slaw, but I've had good 'uns either way.